Statuesque Sci-fi, through Statuesque Pulp, to Statuesque Fantasy. I thought I would write a post to highlight the different figure sizes and proportions that I'm now working to for our different ranges. For each genre - sci-fi, fantasy and pulp - I've altered how I use sizing and proportion, both to provide me with different sculpting opportunities and to perhaps better match the kind of ranges I see the Statuesque figures being used alongside. 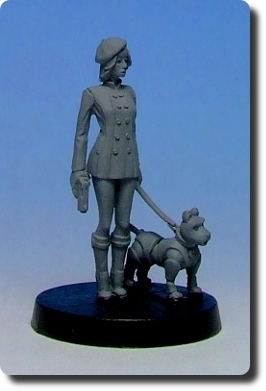 When I first started sculpting for Statuesque Miniatures, I was still working as a commission sculptor. I was often asked to make my figures bulkier than I would have normally at that time. I was still very much learning my craft (I still am!) and what I really wanted to do was sculpt how I thought I should be doing it, rather than what I was told to do. As such, the first Statuesque Miniatures figures allowed me to do just that. 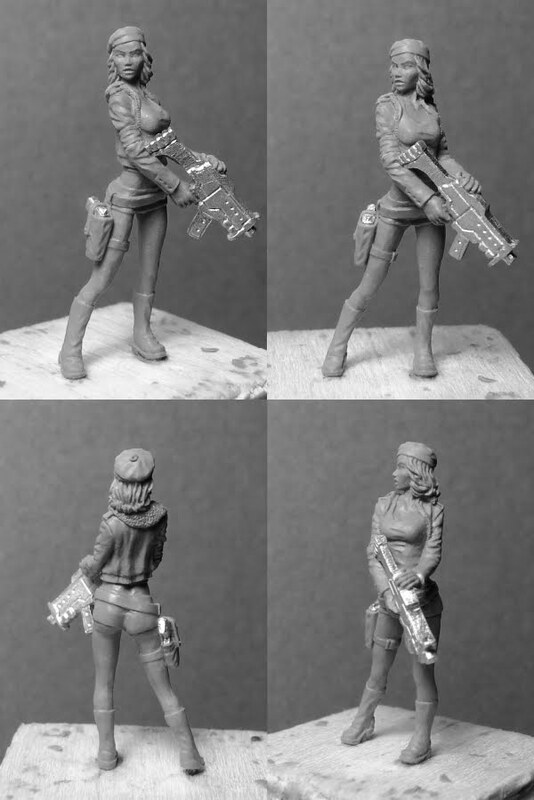 The likes of Havana Gray, the original Mei-Lin Mayfair and Bella the Partisan are at the taller and more slender end of wargame miniatures proportions. This was how I felt it best to learn figure sculpting, particularly female figures, as well as being an antidote to the chunkier figures I was being asked to sculpt for commissions. 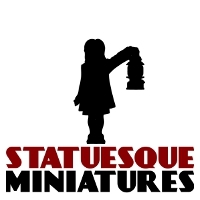 Bella the Partisan - the remaining figure from the launch of Statuesque Miniatures. The rest of the Statuesque Miniatures Sci-Fi range evolved out of these figures, largely keeping similar, slender proportions. All the sci-fi figures, from the S.O.E. Kill-Team to Mei-Lin 2.0 and her Hong Kong Killer Fembots, all work nicely together as a range. So the Statuesque Miniatures Sci-Fi range perhaps features figures more slender than most, but it will work nicely with many other manufacturers' ranges, the most obvious being that of Infinity by Corvus Belli. It should be noted that all the head sprues in the Resistance Fighter Accessories range a designed for the Statuesque Sci-fi range, not as add-on parts for other manufacturers' figures, though I have seen them used nicely on Infinity and Sedition Wars figures amongst others. The recent and ongoing collaboration with Pulp Alley has led to two new pulp ranges - the Pulp Alley range of figures, designed by Dave and Mila Phipps and sculpted by myself, and the Statuesque Asylum range, my own pulp-horror project. Both these ranges share common figure proportions and sizing. It was decided that the pulp genre figures should be slightly chunkier than the existing Statuesque Sci-fi figures, with slightly bigger heads and extremities, to better match existing pulp ranges such as those by Copplestone Castings and Pulp Figures. With such diverse figures already on the market, it would have been a bit silly to try and rewrite things with our new ranges. L-R: Statuesque Sci-fi, Crooked Dice, Statuesque Asylum, Copplestone Castings, Pulp Alley, Copplestone, Pulp Alley, Copplestone, Statuesque Asylum, Hasslefree Miniatures. I've actually really enjoyed that little bit more freedom that the change of proportions has allowed. I feel I can introduce more divergence in the shapes and sizes of the figures I'm sculpting. For example, Phantom Ace is broad and muscled, very much a comic book superhero, while the Frothing Loonies are twisted, hunched and distorted to better portray the madness of their nature. That said, they all work nicely together as a range. The difference between the pulp genre figures and the sci-fi range is also not so great as to stop me using them together in a game. 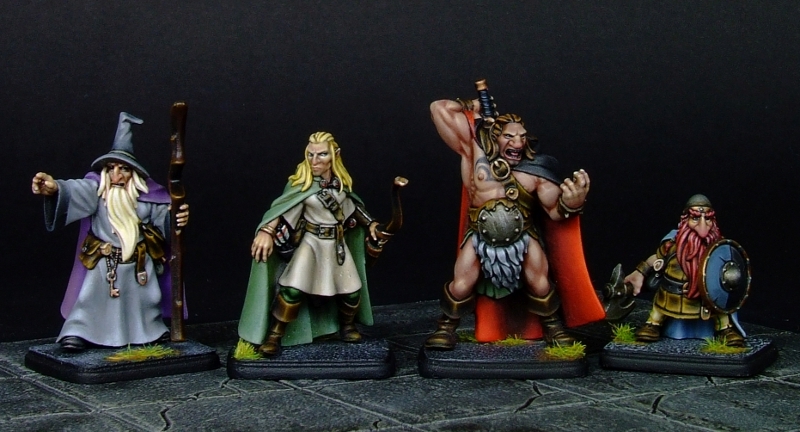 The newly launched Statuesque Fantasy range is not my first foray into fantasy miniatures. That came with the release of the diminutive Ezmeralda Tyke. A very small elf name Ezmeralda Tyke. Ezmeralda was to be the figure figure in a range of fantasy figures themed around a little girl named Lillie Poots and her abductors/protectors known as the Malinquents. The problem was, not long after sculpting Ezmeralda, I switched to digital sculpting meaning a steep learning curve and priorities other than telling the story of Lillie and her friends. 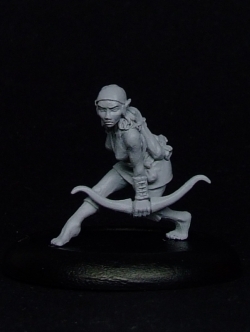 Not only that, Ezmeralda was so small and slight she didn't actually match any of my fantasy miniatures collection. I can only imagine this was of similar concern to my customers as despite being what I consider to be amongst my best work, Ezme has been a very slow seller! Now I could have ploughed my own furrow and expanded the fantasy range in a style similar to Ezmeralda, but the thing is I actually really like exaggerated, caricatured fantasy figures. My Kev Adams Citadel goblins are some of my favourite figures and I really wanted to make fantasy characters of my own that I could use alongside (or more accurately in opposition to) those figures. A big nose, a slightly smaller nose, a wide nose and a very big nose. I'm placing no limits on myself regarding how much I push, pull and break figure anatomy and proportions for these figures. Even the two humans in the range so far, Oorik the Barbarian and Gomeril the Wizard, are very different in their physical characteristics, beyond one being a muscle-bound hulk and the other a withered old man. At the same time, the overall style of the figures means they all work well as a range. 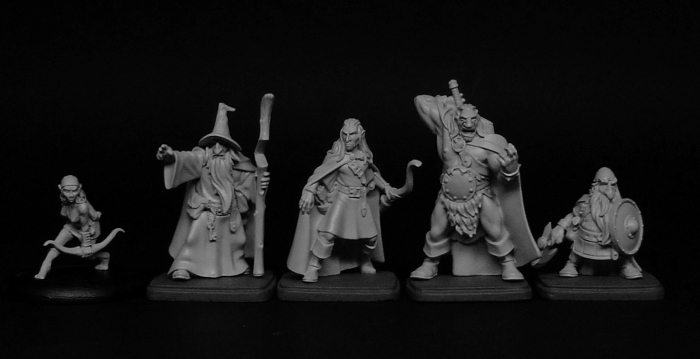 And most importantly of all, I have a group of figures with which to enter the dungeon and hunt some goblins. Being so small, Ezmerlda Tyke doesn't actually stick out too badly. She just looks like a very small elf-like creature. However, due to issues with her mould, she will be going out of production very shortly, once the remaining castings have sold. She may see light of day again, either resculpted or not, and another imagining of her character will certainly be joining Lillie Poots in the Asylum. Our four heroes fail to spot the diminutive, elf-like creature creeping along beside them in the shadows. Finally we come to the black sheep of the Statuesque range, the Heroic Scale Female Heads. These do not fit any existing Statuesque figure, but are designed for use on your heroic scale figures from other manufactures. I sculpted these because there appeared to be demand for heads similar to those that I'd made for the Resistance Fighter range, only larger. L-R: Resistance Fighter Beret heads, Heroic Scale Female Heads, Resistance Fighter Cracking Hairdo heads. The Heroic Scale Heads have proved popular (I keep running out of stock though I've got lots coming in the next restock) so I'll likely add more sprues in future. However, it is unlikely I will do figures to match the heads. You'll have to provide those yourselves. So that's my run-down on the whys and wherefores of the perhaps ever-so-slightly confusing sizing differences between the different Statuesque ranges. I enjoy sculpting to these different styles as it allows me to do something different from the last figure I sculpted, so each range will continue to expand in future. Don't forget there are a number of comparison photos here on the blog so you can judge for yourselves how you think the figures will match your existing collection. Thanks for the run through and the comparison shots Andrew!